A few months back I met an Arab shop owner who after asking me what my son’s name and age was, questioned whether he could recite Surah Al-Fatiha. I responded in the negative and asked that he make dua for him. I was concerned because he first asked about his age which implied that he expected a 3-year-old to have memorized the Surah already. It got me thinking about the best way to introduce this to my son who’s only memorisation of Arabic thus far was basic Adhkar and the dua before going to bed. Surah Al-Fatiha seemed like a challenge in comparison. I remembered how easy it was as a child, to memories the surah’s that were often repeated during Salaah so I decided to try the repetition theory. I started reciting aloud when he was in the car with me and then began reciting Al-Fatiha before reciting Quran each night when I was on bedtime duties. I did some googling too but found most blogs and articles to be very generic and aimed at older kids. I found apps as well but I came across something on Facebook which inspired me to do it the old-fashioned way instead. One night, before doing our nightly Adhkar and bedtime story, I sat him on my lap and read from the Mus’haf using his finger to point down the page. After doing this for a few nights, he began reciting with me and we added this to our nightly routine, Alhamdulillah. My wife continued this routine during Ramadan while I was at Taraweeh and by the Grace of Allah, while we prayed at the Musjid a few nights ago, I heard him recite the entire Surah from memory. SubhanAllah, I can not begin to describe the feeling… so I won’t. I am proud to accept this as our Eid Gift from him this Ramadan, I pray that Allah guide him and allow us the reward from every single recitation In Sha Allah. We’ve included Surah Ikhlas to our routine and during the last few nights of Ramadan my amazing wife also added Surah Al-Asr. I’m looking forward to revising these with him and also coming up with a few strategies that might aid other parents to do the same In Sha Allah. Remember the Quran… and the milk! As part of my Ramadhan prep this year I’ve been looking at ways to increase Quran recitation each day. By spending more time at the mosque lately, I’ve had the opportunity to read Quran more than just once a day which naturally allows me to read more through the day. I’ve tried in the past and tried again recently to use one of the many Quran apps available to recite just about anywhere, anytime while keeping track of my progress each day. Some of the apps are really awesome and allow clear arabic text, english translation, notes and a bookmarks so you know exactly where you’re up to. The main advantage of these apps is the convenience and the progress tracking which is handy, especially when you’re reading at different times and in different places each day. For some reason I can not find comfort in reading on a screen and scrolling through the text. As convenient as it is, I find the experience of reciting Quran on my iPhone or iPad very unusual and slightly un-natural. I grew up reading Quran the old-fashioned way and nothing can beat the familiarity and comfort in holding the Mus-haf (Compiled pages of the Quran or Kitab). I’ve been reading Quran in the same mus-haf for 12 years and no app can give you that feeling of familiarity and tranquility. 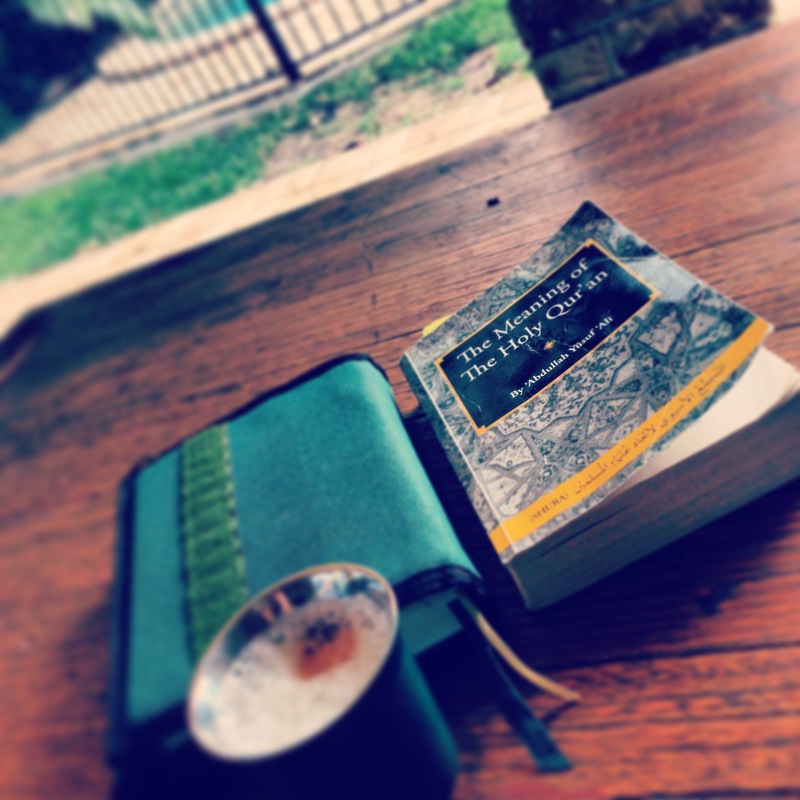 The worn pages, scribblings and date markings add a dimension no technology can emulate but since I can’t carry my mus-haf everywhere, I needed a solution that allowed me to read in any mus-haf, anywhere I went while still keeping track of my progress. 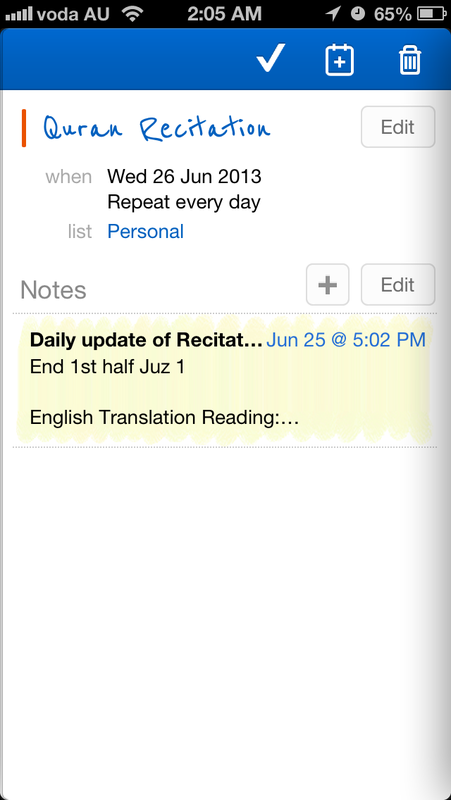 I’ve set it to recur everyday so I’ll have a daily reminder to ‘Read Quran’ and the notes section allows me to keep track of my progress which I can update any time I read, any where I read. It’s working well so far and I’m looking forward to really testing out through Ramadhan InshaAllah. Just love it when technology and religion come together. Alhamdulillah for Muslim Productivity.